U.S. Customs and Border Protection announced that more than 100,000 trusted travelers have been issued NEXUS cards in the Buffalo/Niagara region of New York. The applicant who became the 100,000th regional NEXUS cardholder was a local youth hockey player from Niagara Falls, Ontario. The NEXUS cardholder and his family became aware of the NEXUS program through a joint communication effort involving CBP, Canada Border Services Agency, the Fort Erie Public Bridge Authority and the Niagara Falls Bridge Commission. To commemorate the milestone an event was held at the NEXUS Enrollment Center in Fort Erie with Buffalo Sabres mascot Sabretooth and Buffalo Sabres announcer Rick Jeanneret who presented the cardholder with a National Hockey League Buffalo Sabres hockey sweater. He was also presented with a signed certificate acknowledging him as the 100,000th regional NEXUS cardholder. 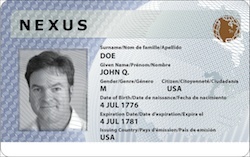 Cross-border travelers are encouraged to participate in the NEXUS program, which allows pre-screened, low-risk travelers to proceed with little or no delay into the United States and Canada. In compliance with the Western Hemisphere Travel Initiative implemented June 1, 2009, all travelers, including U.S. and Canadian citizens, need to present an approved travel document to enter the U.S. by land and sea. These documents include a valid Passport, U.S. Passport Card, Trusted Traveler card (NEXUS, SENTRI or FAST) or an Enhanced Driver’s License. Children under the age of 16 can present an original or copy of their birth certificate.